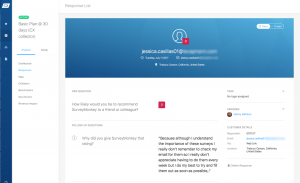 Can SurveyMonkey and Zoho Disrupt Enterprise Software? I know, “disruptive” innovation has become a cliché, but hear me out. Recent announcements by SurveyMonkey and Zoho caught my eye and have the potential of disrupting enterprise software in a way we haven’t seen in a while. But first, a quick word about what it means to be disruptive. Simply put, it creates winners and losers in a market space. If a new technology (e.g. AI) is something everyone can use to improve their solutions, it’s not really disruptive. For example, while artificial intelligence (AI) has many exciting applications, the technologies are widely available and won’t change the order of things in enterprise software if all developers adopt. And they are. To disrupt a market, you need something dramatically different. A unique collection of features that solves an underserved job-to-be-done is one approach. Or, a too-good-to-be-true low price. Improving something by 10 or 20% is not disruptive — everyone is doing something similar. a process by which a product or service takes root initially in simple applications at the bottom of a market and then relentlessly moves up market, eventually displacing established competitors. Let’s take a look at two recent developments where a disrupt-from-below approach could cause enterprise software execs to lose some sleep. The Voice of Customer (VoC) industry has grown up over the past 20 years or so, and now there is competitive parity among several vendors, with the industry slowly consolidating. Yes, there is innovation going on, but new features or capabilities in one vendor are quickly matched by others — via development or acquisition. Normal market maturation, not disruptive. 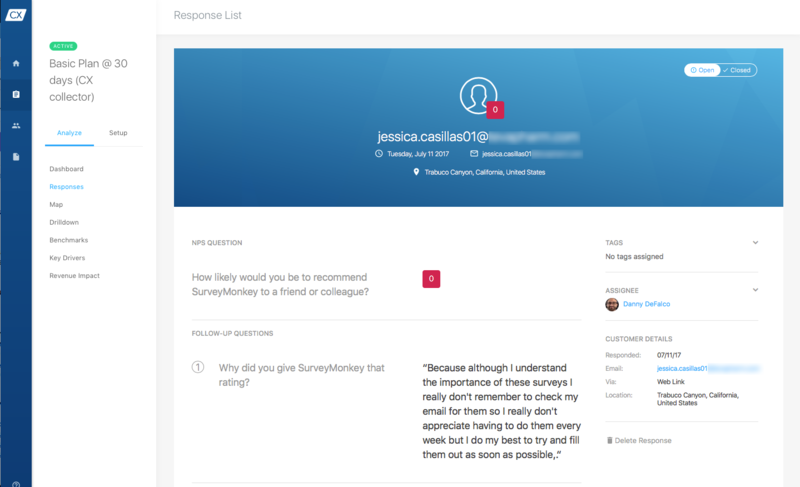 SurveyMonkey would like to shake things up. You’re probably familiar with it as a general purpose survey tool, aimed at small businesses. I’ve been using SurveyMonkey for my research projects for many years and like the affordability and ease-of-use. My take: SurveyMonkey could quickly become the gorilla of the SMB space for VoC programs. Whether it can penetrate the large enterprise space — dominated by companies like Confirmit, InMoment, and Medallia — remains to be seen. I think probably not, as these companies are racing to create more specialized systems targeted to industries, including sophisticated case management and more. But the SMB space is wide open. 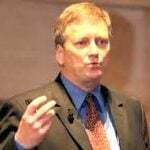 When Salesforce.com was launched two decades ago, it was no match for Siebel or other mainstream CRM applications. On features, that is. But a subscription-pricing model and lower (perceived) costs helped it to become the success it is today. It wasn’t better, it was different. Now Salesforce has become the CRM “establishment” with Microsoft, Oracle, SAP and many others using the Cloud to deliver CRM and ERP applications. The Cloud is not a differentiator anymore, and neither is subscription pricing. Furthermore, as already noted, I don’t think AI will disrupt these markets, because in a few years all applications will be infused with some sort of AI technology. 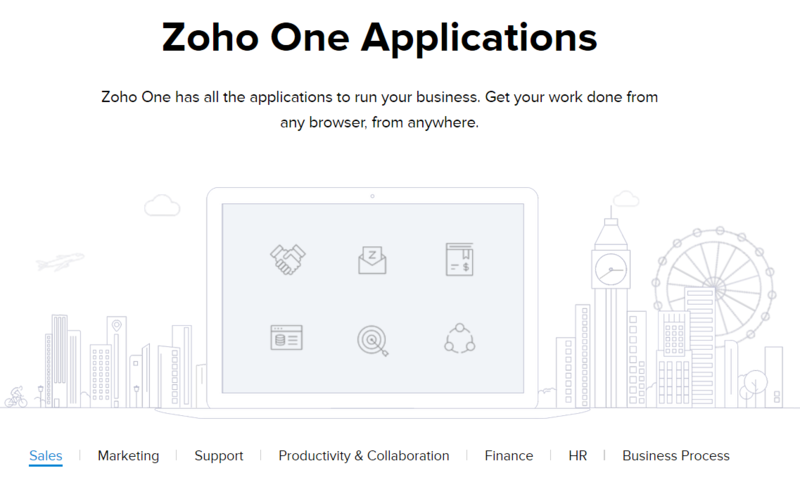 I’ve been following Zoho for years, and have been very impressed with the progress it has made as a bootstrapped software-maker. According to Raju Vegesna, Chief Evangelist for Zoho, the firm has 5,000 employees, operates in 150 countries, and is profitable. 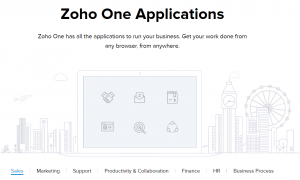 The recent “All-In-One Suite” Zoho One announcement could change the game. For just $1 per day per employee, you get everything. All integrated and and managed with centralized admin and provisioning. The pricing is certainly enticing, because it’s not unusual for just one of these applications to cost $30/month. Even if you only use a few, the savings could be substantial. I don’t have personal experience using Zoho apps, but a quick tour of some software review sites (GetApp, G2Crowd, TrustRadius) confirmed that Zoho has competitive offerings. Again, the game is not winning the feature wars, but offering an “operating system” of applications that work together at an “irresistible price,” says Vegesna. A price, he hinted, that might actually decrease in the future. My take: this could be a game changer for SMBs, startups, and solopreneurs. I’m running a small business with a collection of applications (QuickBooks, SurveyMonkey, MailChimp, MS Office, …) that are priced well individually, but collectively add up. If I was starting my business now, Zoho would get a serious look. It’s basically like NetSuite but priced for small businesses. Both SurveyMonkey and Zoho are pursuing strategies that emphasis product and price. But, like it or not, sales and marketing spending does play a role in building a brand and driving sales. It’s expensive but necessary to penetrate large enterprises. That’s why I think that SMBs are the most fertile opportunities for the disruption discussed here. What do you think? Will SurveyMonkey and Zoho disrupt enterprise software? Share your thoughts in the comments. Disclosure: This post is part of my independent coverage of technology industry developments, and is not an endorsement of any company mentioned.